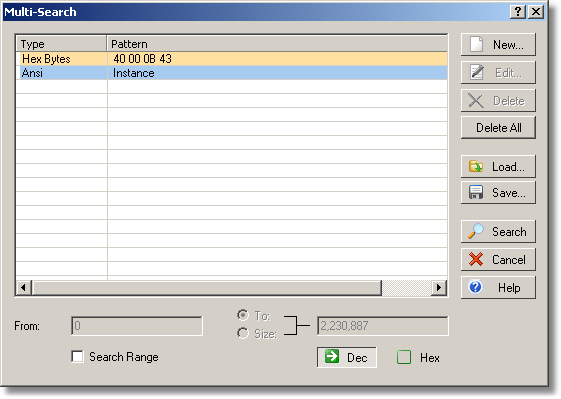 The Find All command can search for a single pattern only, so searching for several patterns needs several passes. The Multi-Search command performs only one pass, no matter how many patterns are being looked for. The Multi-Search command lets you specify a different color for each pattern. Unlike the Find All command, which searches the whole file, the Multi-Search command can scan only the specified range. Because of the two latter options, sometimes Multi-Search is preferable to Find All even for single-pattern search. The uppermost group of four buttons lets you create, edit, and delete search patterns. The Load and the Save buttons perform reading search patterns from a file, or saving the currently defined patterns to a file for later use. Checking the Search Range box makes available the From and To/Size fields, where you can specify to what part of the file the search should be limited.